It’s no secret I am a fan of the Art Elements group. Their blog is always filled with inspiration and great art. I was very pleased to be able to participate as this month’s components are lampwork scarabs made by Sue Kennedy of Sue Beads. 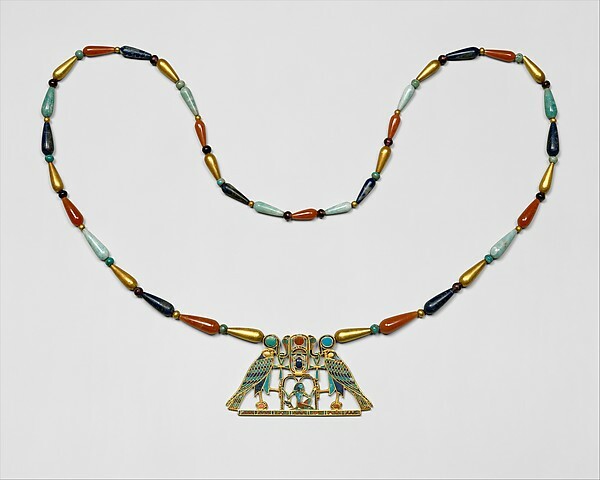 The inspiration for my design is a necklace from ancient Egypt located at the Metropolitan Museum of Art. 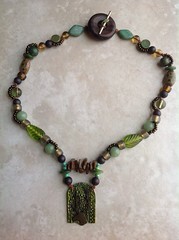 Since I love dangles, and prefer shorter necklaces, this is my version of the necklace. I hope Sue likes what I made with her awesome bead. Of course, she makes them in several colors; collect them all! Hmmm…I wonder if faux coral scarabs are on the horizon. It would be cool to make a bracelet of lapis, turquoise, and coral lampwork scarabs. I loved these beads the moment Sue posted her first one on social media. When I saw this color, I knew exactly what I wanted to make. Here is a great video by Tracy Statler in case you want to make one also. I would recommend tying knots at the ends so the final adjustment bead (I didn’t use a pony bead) can’t come off. I started with one yard of silk sari and one foot of that was used for the knots, so two feet wrapped round my wrist three times. The blue sparkle lampwork spacers were made by Samantha Capeling of Venus Art Glass and the other bead is vintage glass I cut off a broken bellydancer’s belt. I am really pleased with it, as I made it to wear with my David Bowie necklace. Space scarabs! 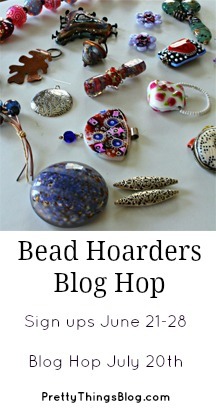 Please join the blog hop and see what everyone else has made with Sue’s awesome beads. 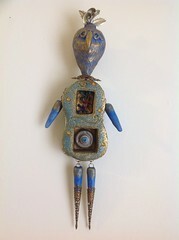 This entry was posted in jewelry making and tagged Art Elements blog, Egyptian jewelry, lampwork scarabs, Sue Beads, Venus Art Glass, windbent. Bookmark the permalink. Love your necklace, it’s really special. You really captured the Egyptian feel. I like the wrap bracelet a lot too, it’s a very different use of the component but works just as well — have fun wearing it! Both pieces are beautiful and I love so much to know the tiny details of the bead history, like the bead from a broken bellydancer belt. I love it when a piece with all its parts has stories inside it. wow what completely different pieces you made! Your necklace really is a show stopper but I just love the bracelet, it screams opulence and I just love the beads you used! your necklace connector with the Egyptian symbols is spectacular. the colour combos of the finished necklace are in keeping with your sample piece. very Egyptian colours too. I love the simplicity of the silk bracelet. I have a bunch of sari silk like that and I find the frayed edges always limit my design process. too messy for me perhaps ? but this goes to show how well ragged edges can be used to advantage. well done. Wow Lennis, you went all out Egyptian! That was a lot of work, I love the incorporation of the the other beads! Fantastic! 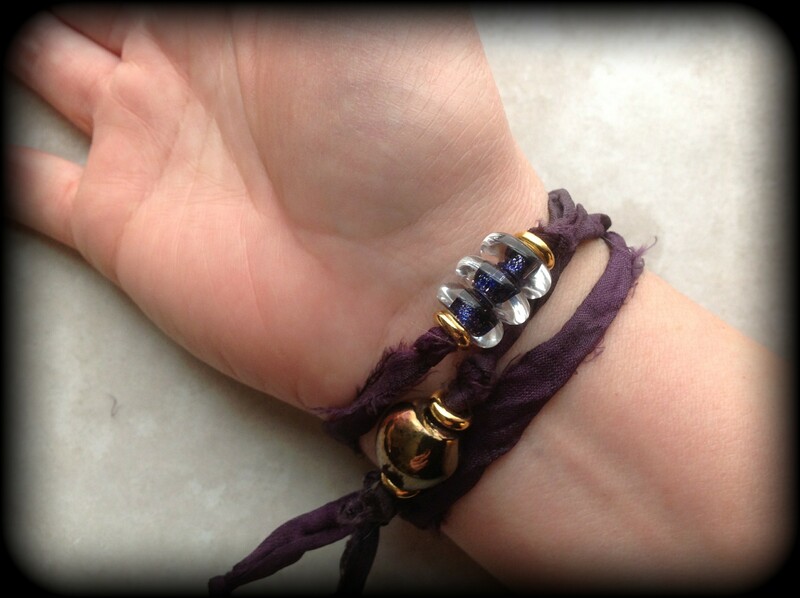 Love your bracelet as swell! Thanks for playing along! 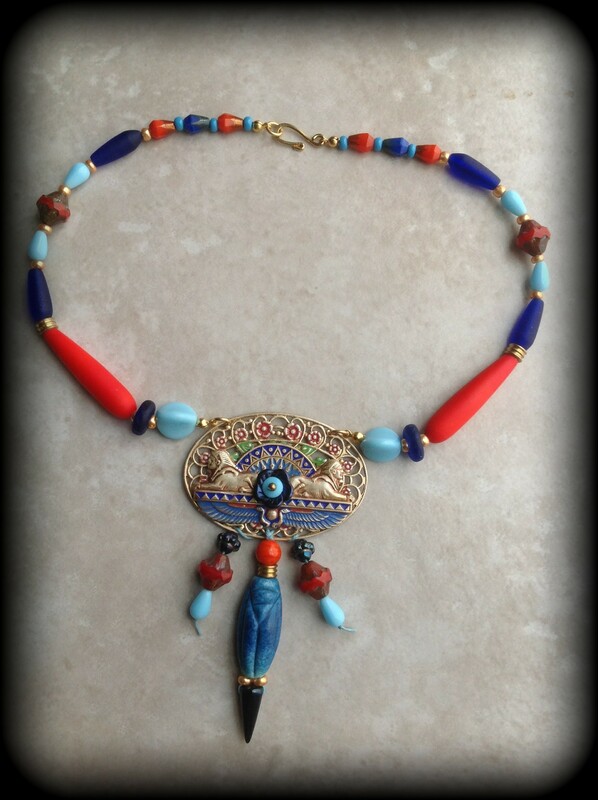 I absolutely love your Egyptian inspired necklace! 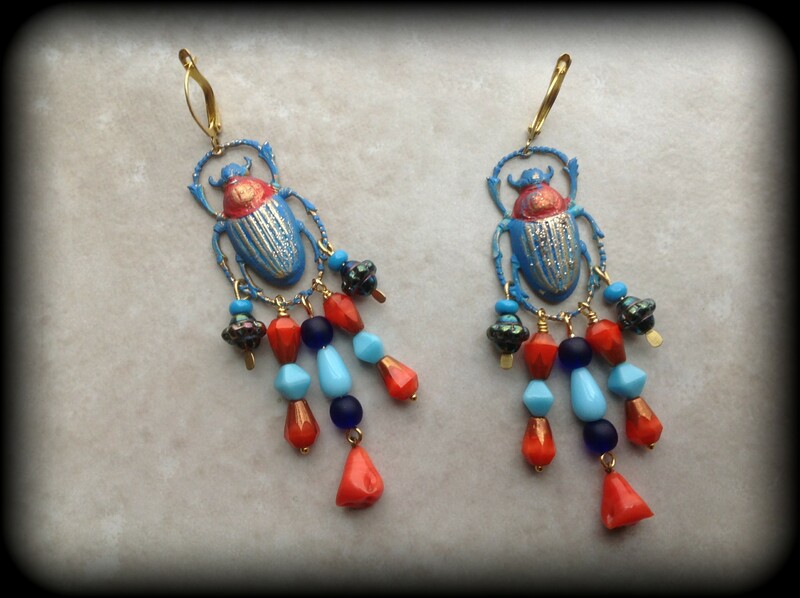 Sue’s scarab is perfect for the design-the color of the scarab and those faux coral beads….love. And your bracelet is fabulous. I may have to try making one of those. I love the idea of faux coral scarabs. Sue, are you listening?! The Egyptian necklace is wonderful and I love the wrap bracelet. Such cool designs! What a stunning necklace! You’ve really captured the Egyptian feel with that, I bet it’s fun to wear! 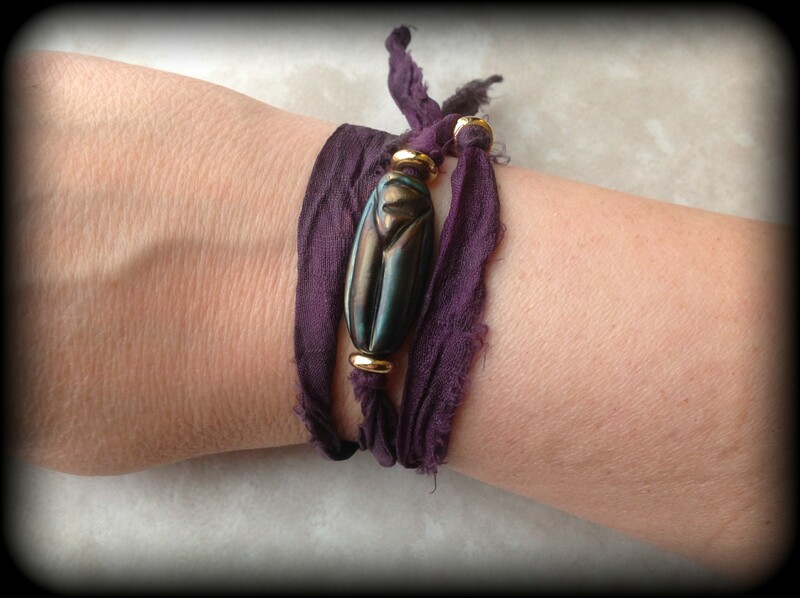 Love the wrap bracelet too, the silk gives it a lovely contrast! Ahhhhhhh Lennis…those earrings and that necklace! Amazing! 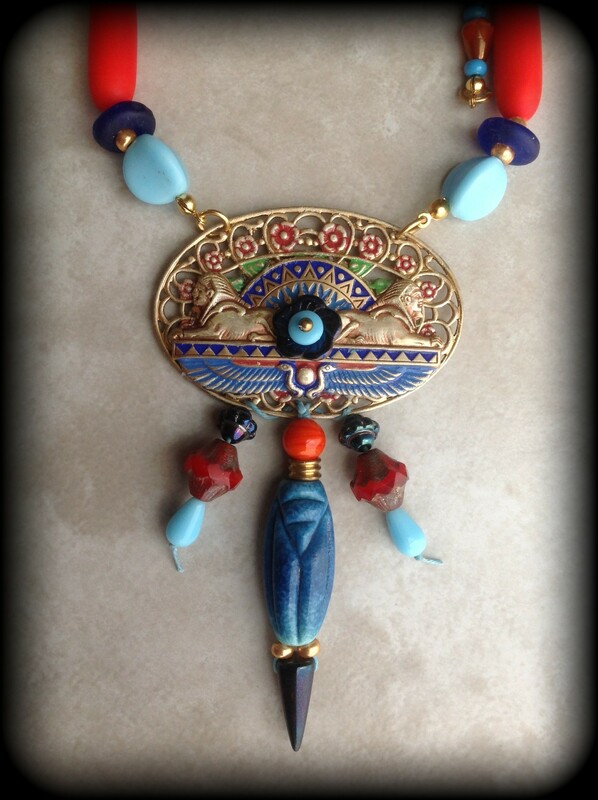 You really captured the spirit of the scarab beads and Egyptian jewelry! Love! Forgive my typo since I hadn’t finished my coffee. 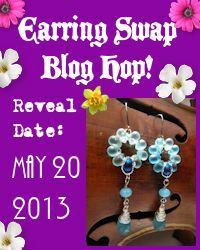 Also, it made me laugh to see the picture of the scarabs matched your shirt perfectly in the photo on your blog. Love, love, love it all! I totally feel the Egyptian vibe. 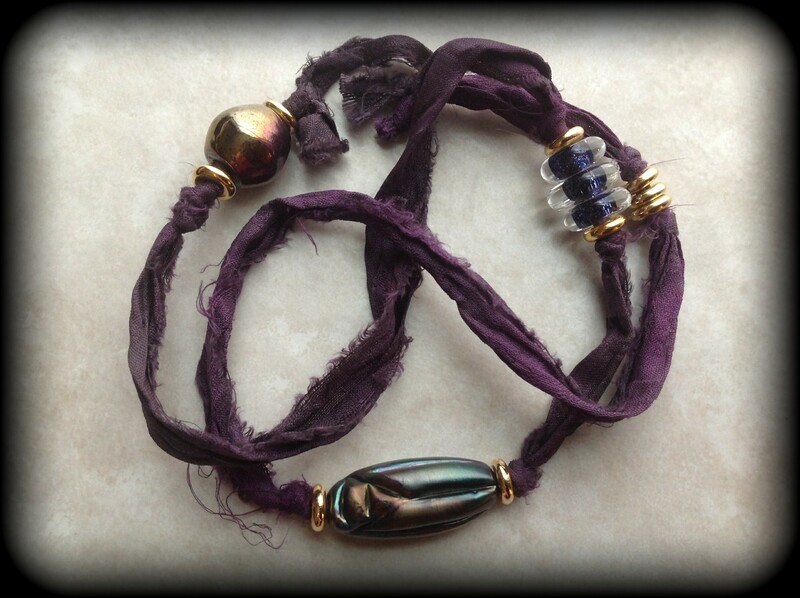 And Bowie would be pleased with the Space Scarabs wrap bracelet! You truly worked magic here. Such awesomeness! VERY COOL! That necklace is very special and the wrap bracelet is perfection. Thanks for participating in the challenge this month and for reading Art Elements! I’m so impressed…….awesome work! Anyone can tell by the quality of the pieces that you truly love your work. Keep it up Lady! 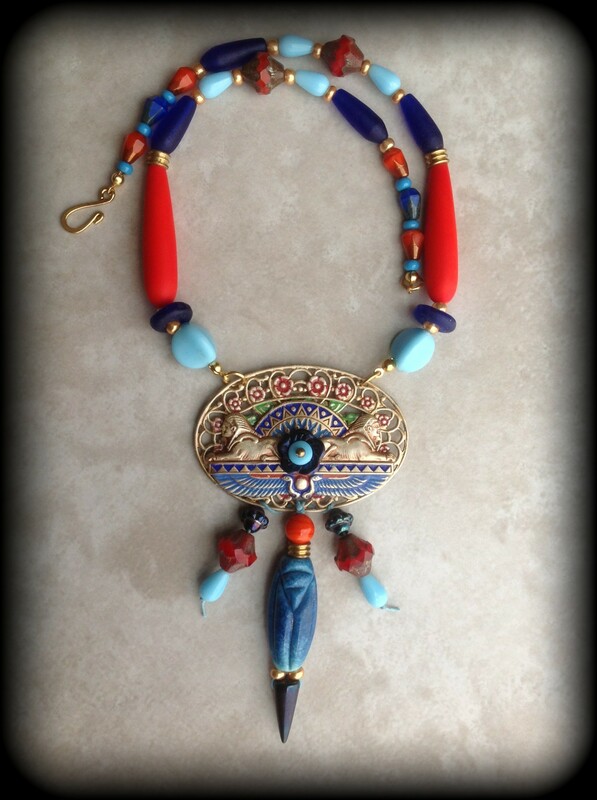 Fabulous necklace – a real statement piece and then a lovely wearable bracelet…great work. Each piece turned out beautiful! Thank you for playing along with us this month!